I don’t really know what his final arrangements were, but I totally agree with Guy, the only two things that money can’t buy are true love and homegrown tomatoes. I’ve got the true love part going really nicely as I’ve been married to the love of my life, John, for 50 years now and we expect to be walking, talking and laughing together over the occasional homegrown tomato for many more years. Like these beauties in the picture which are approaching edible with agonizing slowness. My son-in-law, Chuck, gave me a terrific tomato plant and it is doing its best to produce the most gorgeous round red globes of deliciousness possible. The growing tomatoes part’s not quite so easy. In my opinion, one of the horrors unleashed upon the world when Eve picked that forbidden fruit, making God really unhappy with her and with Adam, is the tomato worm. 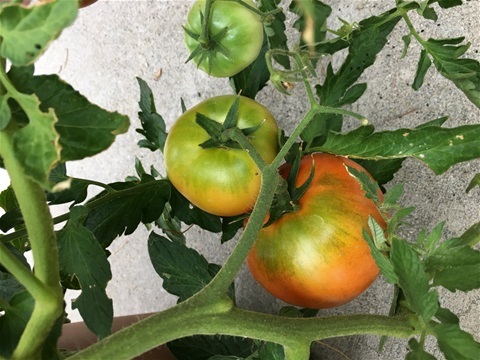 There you are, admiring your rapidly growing tomato plant, feeding it, talking to it, nurturing it and admiring those cute little green baby tomatoes...all is well in your particular Garden of Eden. Then one morning you walk out with your cup of coffee and find that your tomato plant is in shreds! Leaves have been chomped to bits and all the little yellow blossoms signifying many more tomatoes on the way have been sucked dry, leaving nasty little brown blossomless husks. You stand there, mouth agape, in shock and horror. How could this devastation have taken place in just one night. Your eyes narrow into beady beacons of rage. Tomato worm! With shaking fingers, you put your coffee down. You paw through your previously beautiful tomato, searching relentlessly for this spawn of Satan and find...nothing. You follow the icky little trail of black dots of tomato worm excrement and find...nothing. Heart pounding, you turn over every leaf and find...nothing.